Outspoken Queensland MP Bob Katter says if his new political party were ever to win power federally it would force the Reserve Bank to lower interest rates – even if that meant heads had to roll. Katter’s Australian Party (KAP), which was registered in late September, wants to devalue the Australian dollar by reducing interest rates. The party’s policy platform states that the official cash rate should be brought into line with the rest of the world at between one and two per cent. The Reserve Bank of Australia (RBA) cash rate is currently 4.25 per cent. Addressing the party faithful on the Gold Coast this week, Mr Katter made it clear that if the Reserve refused to play ball board members would be removed individually or the entire bank “replaced with another body”. “I don’t want to be advocating political involvement in the Reserve Bank,” the party’s founder told AAP on Saturday. Mr Katter said the RBA was using interest rates to control inflation but it wasn’t an effective tool. Further, Australia didn’t have a problem with inflation, he said. The federal member for Kennedy said the high Australian dollar was “murdering” tourism particularly on the Gold Coast. He noted that Europe currently has interest rates around one per cent while the United States is at 0.25 per cent and Japan zero. “We are 500 per cent out of step with the rest of the world,” he said. A Katter-led government would request the Reserve to lower the official cash rate and if if it didn’t would “take action”. 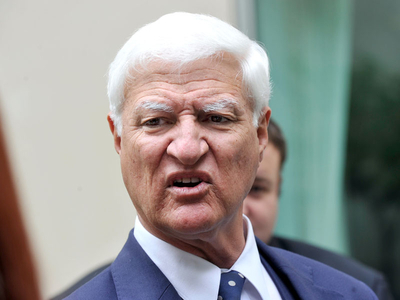 Has “Mad” Bob Katter been reading Mark McGovern’s paper on Australia’s Debt Dreamtime too? Now, watch all the usual suspects … the government, Treasury, “expert” economists, talking heads et al – come out in force to denounce Bob’s policy as “mad” and “extremist”. Just like they jumped all over Senator Joyce in 2009-10, for his courageous, prophetic, and correct call on the danger of ever-rising US debt levels. Oh yes … by the way. “Mad” Bob is right on the money concerning the Great Global Warming Hoax too. He’s on to the bastards! And to top it all off, “Mad” Bob wants to change or remove outright the many ridiculous “Big Brother” nanny state laws … think fishing, firearms, camping, billy-boiling, etc … that seek to prevent us blokes from being proper blokes, and turn us all into soft, jelly-bellied, quiet, passive, make-no-trouble-for-government sheilas. Definitely my kinda bloke, is Bob. Begone our pathetic Australian cultural cringe … I admire good old-fashioned rough ‘n tough Aussie blokes. Doubtless their slowly dying out is a big reason why I love old folk, and regretfully concede to feeling a mixture of scorn and sorrow for the latte-sipping, preening, “how-do-I-look?” obsessed, all-things-American-idolising Gen X and Y. Hey Barn! How about pulling up stumps from the LNP coalition, and teaming up the National Party with Katter’s Australia Party? While I never thought that the progressive Left could teach us anything of worth, at the last Federal election they did. Those leftard voters who swung from Labor to the Greens were able to grab the reins of this country and steer it by their own faulty compass straight towards the perils of a carbon tax. Imagine a brighter future, where, in place of the current monstrous Labor-Greens hybrid, Australia is governed by a minority Coalition government dependent upon the support of a party committed to solid conservative principals. And we know that [Bob] Katter wouldn’t compromise those principals should such a deal be struck. He wouldn’t sell us out. We witnessed that when sides were drawn in the aftermath of the last Federal election. So if we want to turn this country around before we are forever trapped in the snares that the Left are setting, right-thinking Australians need to take a leaf out of the progressives’ playbook and change our own voting habits. Thanks to Katter, we finally have another viable choice: a new party that appears to be prepared to put the national interest and the rights of Australians above the dreams of dangerous globalists, be they crony capitalists or enviro-communists. Katter is currently building a solid team for the Australian party’s inaugural run in the upcoming Queensland State election … The party currently has 43 candidates in place and plans to have about 75 by the time the election is called next year. Moreover, early poll figures indicate that it is set to replicate One Nation’s initial electoral success in that state. … [L]et’s hope that Katter can round up an equally capable posse to join him in the Federal arena. Because good folk all across this great nation have been circling our wagons for some time now. We’re surrounded and being worn down by an ever-encroaching federal government, a rabid Marxist ideology that disguises itself behind political correctness and environmentalism, and a crony capitalist system that is inimical to both small business and what’s left of this country’s agricultural and manufacturing industries. The Australian party is shaping up to be our long-awaited cavalry. 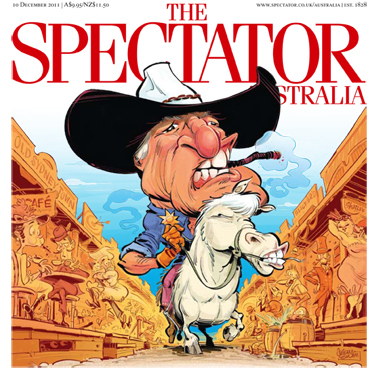 Which, after all, seems fitting, because the white-hatted Bob Katter is leading the charge. “I’ve always believed that if there’s a marketplace out there that can be filled in its political requirements by someone who can articulate a cause that collects a vote – good luck to them. That should be the job of all of us,” the Nationals’ Senate leader told ABC Radio today when asked about the idea of a new political party. Australia doesn’t have an inflation problem? I suggest Mr Katter try telling that to the countless families out there who are struggling more and more with both the cost of living and the cost of their mortgages due to the inflation of the property bubble. I think you are wrong on a number of fronts in advocating the RBA lower interet rates to come into line with the rest of the world. A zero or too low interest rate policy was a disaster that caused much of the credit bubble in Europe. Combined with running the Printing press this policy threatens hyperinflation. Regardless of that the cost of sourcing money overseas is rising due to a lack of supply. So lower RBA rates won’t matter much anyway. The more out of sync the RBA gets with the real market the less influence it has. Finally our high dollar is due predominantly to our relatively good fundamentals (only compared to the terrible fundamentals of nearly everyone else), strong commodity prices and high demand for our exports. With the mining boom over & Gillard – Swan doing everything they can to wreck our fundamentals the AUD will continue to weaken. If Bob wanted to decrease the price of money he would advocate decreasing Govt demand for it through borrowing & increasing supply of it through surpluses. Bob is still a dangerous protectionist buffoon. For starters I can’t help but wonder why someone would oppose protectionism unless they were either a financial predator (eg Coles and Woolies in the grocery sector) or directly benefited from their actions- after all the only ones who benefit from opposing protectionism are predators, be they direct or indirect. A couple of flaws with this reasoning. Even acknowledging the situation, to say that we have good fundamentals, even relatively good ones, is pure fallacy. This country hasn’t had good fundamentals since Hawke and Keating first adopted the financial reforms originally put forward by the Coalition under Fraser and Howard. Then you have the issue of our exports. What we have now is an Adam Smith based economy of specialisation where this country is nothing more than a glorified quarry. We take our raw materials out of the ground, add no value to them, then import them back with value added on the other end. That’s not trade; that’s looting! About the only accurate thing you have said there is that our credit rating is good because of demand for our resources when you bring up strong commodity prices..
Thirdly you say “Combined with running the Printing press this policy threatens hyperinflation.”yet what led us here is the decoupling of our dollar and complete financial deregulation of this country to begin with. Your whole argument is like that of so many here in Australia- you hate what’s going on, yet you support what got us here by opposing the measures which originally prevented it from happening to begin with- namely foreign investment, financial deregulation and protectionism, which the former 2 fall under the umbrella of. John, I agree with your concerns. This topic is complex and nuanced – I’ll try to just briefly touch on your points in order, so please don’t misconstrue brevity for bluntness. >>A zero or too low interest rate policy was a disaster that caused much of the credit bubble in Europe. Yes, and no. In my view, credit bubbles have far more to do with lax (and often, predatory) lending standards, than to the rate of interest being charged. >>Combined with running the Printing press this policy threatens hyperinflation. >>Finally our high dollar is due predominantly to our relatively good fundamentals (only compared to the terrible fundamentals of nearly everyone else), strong commodity prices and high demand for our exports. I believe that our high dollar has far more to do with “hot money” flowing into the AUD, as a direct result of our having interest rates well in excess of the rest of the world. There are literally trillions per day sloshing around the world in the international “carry trade”, whereby (eg) the elite few with access to the US Fed’s “discount window” can borrow billions in USD at 0.25%, and “invest” in the AUD at 4.25% plus. In my view, the main reason why the GFC saw the AUD plunge from parity to 60c in about 3 weeks, then rise up again afterwards to $1.10, then more recently below parity again, is a direct result of the “carry trade”. On a much smaller scale, there is abundant evidence going back many many years, that Japanese households are big “carry trade” “investors in the AUD – borrowing in JPY and investing in (eg) AUD-denominated term deposits with Aussie banks. Pure speculation, encouraged by RBA interest rate policy. In essence, the AUD is a “risk on” currency – speculators pour money into it (to get the higher interest rate spread) when they believe global conditions are ok, then quickly repatriate their money when fear rises (“risk off”). Today’s other post referencing Mark McGovern’s economics paper is very well worth a read with regard the RBA’s deleterious impacts on our economy. He essentially confirms what I have long believed to be the case. >>If Bob wanted to decrease the price of money he would advocate decreasing Govt demand for it through borrowing & increasing supply of it through surpluses. Yes, that is one way to achieve it. >>Bob is still a dangerous protectionist buffoon. I think that is perhaps a little too harsh, John. IMHO, his heart appears to be in the right place, and on this and other issues he is on the right track, broadly speaking. With appropriate advice, his willingness to go contrary to the popular (false) paradigm/s is very promising. I don’t know that the government should be “controlling the economy”. Interest rates here are going to zero as they are everywhere so Katter doesn’t need to sack anybody. If he really wanted to make a difference he would give the RBA its independence for real, as in stripping the RBA of its legal tender monopoly. I don’t see him doing that. At one level I disagree with you here. As lesser of two evils only, I’d prefer to abolish the RBA and give Treasury the legal tender rights … because at least (in theory) they’d be answerable to the politicians, who are (in theory) answerable to the electorate. The RBA is answerable to noone. Better still, IMO, would be to strip them all of exclusive legal tender monopoly rights, and let private citizens decide whose “money” to use. Actually TBI, the ‘stated’ reason for having an ‘independent’ central bank is to allow it to operate without political interference. Of course this is merely stated & the RBA has never been independent, it is an arm of the government. Nevertheless, political interference has time & again lead to the demise of the credit of central banks’ the world over. The only option is for the government to redeem its financial obligations, thus removing its ability to inflate credit bubbles by leaning on the central bank. Yes, the whole “independent” charade is to create a smokescreen viz. public perceptions. Incidentally, this was the original concept of the Federal Reserve Bank in the US. The original charter of the Fed disallowed the monetisation of government debt, the assets of the Fed were to be Bills of Exchange, which are a form of self liquidating credit drawn on retailers by producers (of real goods people required). Federal Reserve Notes (the US dollar) were redeemable in gold at a fixed rate, thus the assets of the Fed needed to be kept as good as gold. Fed to monetise government debt to finance the war. After the war the government first tried to inflate out of trouble (the roaring twenties) then defaulted. Nothing has changed since. As if we didn’t already know but I think these articles sure explain the real story in Libya. I reckon its only a matter of time before those weapons smuggled from Libya make a play. It looks like the US backed regime is not going to give up without a fight, not that I’d expect them to.